"I need healing therapy for grief and other strong emotions as a result of losing my beloved pet." The loss of a pet is a devastating experience in any pet lover's life. When your best friend leaves, one who has been loyal and unconditionally loving to you, no words can describe the pain. Griefing is a natural process and a healthy one. A special candle light ritual (or whatever suits you) to celebrate your pet's life, release tears and let go of your pet's spirit into the divine is often very helpful. Griefing becomes a concern when the bereavement process is suppressed, prolonged or clouded by guilt, worry and attachment of the mind. This can negatively affect your health, work, relationships and life in general. WildPets Griefing Formula: Designed to help you release and melt away the sadness, emotional heart pain and guilty feeling associated with the loss of a pet. It helps you move forward into your new experience with understanding. Your cherished memories and bond with your pet will always remain with you in your heart. Also excellent for griefing pets. Animal Communication Session: It is immensely helpful to pet lovers who are dealing with pet loss to talk with their pet's spirit who has crossed over to see how they are doing. Our animal communicator / pet psychic medium can help you create this two-way conversation. 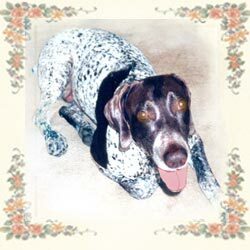 Many clients, after communicating with their pet's spirit, feel a sense of closure, comfort and relief. It helps to settle the worrying mind. One-on-One Healing Session: For pet lovers who feel the impact of pet loss in a dramatic way and need extra help. Also for those who know their feelings are compounded with the pressure from other areas in their life. "Hello Pearl, thank you for last night's phone session. When I slept, I had a beautiful dream in which Toonces visited me. I awoke feeling her love all around me. In fact, I begin each day by drawing a card of words. Today I drew 'love'. I appreciate your kind approach and gentle suggestions. My focus has shifted from recriminations to positive memories. Blessings to you, Eliana." Autumn came to us to help her cat Carter with multiple ailments and some serious mouth, gums & upper respiratory infections, since the vet visits and treatments were not helping at all. However, Carter passed away before any help could be given. Autumn was completely heart broken and decided she needs help for her grief. So we did an animal communication reading with her to hear from Carter, plus a pet loss healing session to clear some of the more intense feelings Autumn was having. "I'm not sure what I would have done without having that session with you when we did! I still have a tremendous amount of guilt that things could have/should have been better for her, and for us, and it's so hard coming home to an empty apartment! Despite all that, the information in the communication really really did give me a way to center myself and carry through this so much better then if I had been without it!! It's been a light I just would not have even remotely had and don't know what I would have done without! I absolutely can not imagine how much harder getting through these initial weeks would have been without having had that chance to hear from Carter and without your counseling and understanding!" If your pet has passed on, cover and leave the body in a quiet place in the home or cremation services (if weather is hot or pet had infections) for 3 days. Put personal belongings with familiar smell nearby. This will allow the spirit to adjust and move on. Take proper time to plan for burial or cremation. Don't rush. Perform a ceremony for the beloved animal who has passed on. Include other pets and human family so everyone can give their respects, offer fond memories and gain some closure. Do not suppress tears, anger or frustation. Plan some private time, close your eyes, express out loud what's on your mind and let the emotions flow. Breathe deeply. If other people don't care or judge your feelings, it is perfectly ok. It is not their responsibility to understand and appreciate your feelings, it is yours. Try to eat well and take supplements during this time as intense emotions can lower the immune defense. Animals are very sensitive and readily pick up your sadness and intense emotions. Therefore, it is just as important for you to heal this grief as your other family pets. Don't be surprised if you notice signs that make you think the spirit of your animal companion is visiting you. They often say 'hi' to let you know they are ok! Understand that we grief because we miss our lovely pets in their physical form, not because death is the end of the road. It is not. Absolutely not! Note: Response to remedies varies by individuals and individual cases. If the Griefing Remedy does not give complete healing, you may need one-on-one attention through our animal communication or pet loss healing.